One of the first activities in the project was to develop a baseline study which will present legal and institutional framework for the provision of social welfare services by civil society organizations and their role in providing these services in the region of the Western Balkans.The study is based on desk-analysis and series of semi-structured interviews with the stakeholders from CSOs and public institutions from Bosnia and Herzegovina, Croatia, Montenegro, Kosovo and Serbia. The Annual Growth Survey 2014 shows that unemployment has reached unprecedented levels in the European Union, while inequalities are steadily growing. In order to achieve the Europe 2020 targets of a 75% employment rate, increasing the number of adults completing third level education to at least 40% and reducing the number of people living in poverty by 20 million, the EU has to step up efforts to promote of a high level of employment, guarantee adequate social protection, combat social exclusion, promote access to education and increase participation in lifelong learning. The social economy is an essential pillar of the European social model and its actors play an important role in maintaining social services and in overcoming economic and social crises; in recent years 3.5 million new jobs have been created in the social economy. The social economy accounts for 10-12% of the European economy and its actors constitute an important economic force, stimulating innovation by pointing out existing deficiencies and inconvenient truths. By their nature and by the work they do, they contribute to establishing a more cohesive, democratic and active society, and often with favorable working conditions. 4. SOLIDAR publication – Europe 2020: how to spur social progress for a more inclusive Europe? In 2010 – when the Europe 2020 Strategy was agreed – European economies were experiencing low growth and productivity. In many countries the situation steadily deteriorated, leading to a severe financial crisis. The immediate response of the EU was to focus on fiscal and financial consolidation through austerity plans which resulted in even more inequality for poor and vulnerable people. 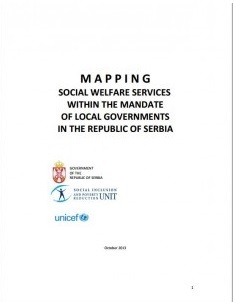 Mapping Social Welfare Services, initiated by the Government of Serbia Social Inclusion and Poverty Reduction Unit and UNICEF Serbia in collaboration with the Ministry of Labour, Employment and Social Policy, was implemented between September 2012 and February 2013. The survey was carried out by the Centre for Liberal Democratic Studies (CLDS). Analysis of the impact of public policies and factors affecting inactivity: Opportunities for raising activity and employment in Serbia. This report has been prepared as part of the OECD LEED Programme “Boosting Social Entrepreneurship and Social Enterprise Creation”. A team comprising members of the OECD LEED Secretariat and an external expert visited Serbia in February/March 2012 for a study visit to examine the role, both actual and potential, of social entrepreneurship, and the support which could be given to social enterprise to boost its potential performance. This report is based significantly on the preliminary report prepared by the local experts, the available statistics and on material gathered from the study visit, as well as research conducted both prior to, and after, the study visit. The purpose of the Study is to present to the general public in Serbia in a relatively systematized way the knowledge regarding the social process in the EU, as well as to open a debate on the possible ways to improve the level of social integration in Serbia through political process. 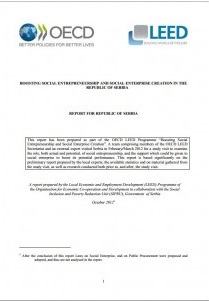 The Study was produced as a part of the project „Promotion of Social Inclusion Debate in Serbia“, supported by the EU’s Employment and Social Solidarity Programme PROGRESS (2007–2013) that was managed by the European Commission’s Directorate-General for Employment, Social Aﬀ airs and Equal Opportunities, and realized in the period from February 2009 to July 2010.